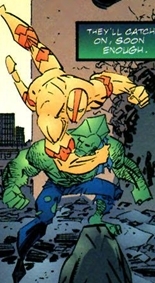 Yellow Streak was one of the Vicious Circle goons that accompanied Big-Fish on a heist that was foiled by Dragon and Smasher as the pair returned to action as part of the S.O.S. The group were single-handedly defeated by Dragon whilst their leader was taken down by Smasher. Nothing more was seen of Yellow Streak until much later. Mako recruited him and numerous others to form an army that would confront the death-dealing Solar Man. Yellow Streak was just one of many that fell to the hero’s merciless might.